Email records prove that a U.S. Sugar lobbyist has been directing policy at a state agency. 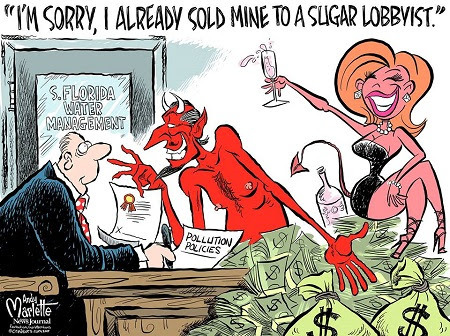 TC Palm’s Lucas Daprile uncovered a truth this week that too many people already knew: Sugar controls the South Florida Water Management District and actively blocks clean water rules and Everglades restoration. It turns out they absolutely are the ones making the decisions, and Grunwald knows better. The industry has been getting a pass from journalists on a foundational lie: that sugar is operating in good faith, doing its part to solve Florida’s water management crises. DeFede’s documentary, The Everglades: Where Money, Politics, and Race Collide, never really challenges that lie, and so it’s a confused jumble of lesser untruths, truths, and half-truths. It follows a sad tradition of blaming everyone and no one for a problem too complex to solve. Fixing the dike is the real solution. One of the few outright lies in the segment was “Lake Okeechobee is kept artificially low” to prevent dam failure. There’s no “naturally high” level on a dammed river, there are no plans to keep more water in the lake after repairs are done, and more water would only lead to more discharges. Toxic algae-fueling pollution comes from the north. This is a very careful half-truth, and DeFede did mention the decades of back-pumped sugarcane runoff that fouled Lake Okeechobee. It’s still there, feeding toxic blooms alongside more recent sources, and it will keep feeding blooms for generations even if not another drop of phosphorus enters the lake. The industry’s legacy pollution is producing toxic algae, and calling out other polluters doesn’t change that. The sugarcane industry has cleaned up its act. Another half-truth. Treated sugarcane runoff is at least twice as polluted as the law requires, according to current data from state scientists. Studies show it’s also half as polluted as it once was. That’s a long, long way from clean. Septic tanks are the real problem. Studies estimate septic tanks contribute 3%-4% of the phosphorus in the St. Lucie. How is the other 96%-97% anything but the “real” problem? Meanwhile, DeFede’s use of Crystal Lucas’ senate testimony on septic tank inspections implies her support for the septic tank red herring--untrue and sleazy. Buying farmland hurts glades communities. It’s awfully rich to let community leaders threaten people with “economic devastation” when ⅓ live below the poverty line. DeFede’s reporting deserves some credit here, using Edward R. Murrow’s Harvest of Shame (1960) to explore a legacy of exploitation and lack of opportunity that sugar companies and elected officials allow to continue today. He even calls out the cynicism of using residents like human shields, to become the story when public opinion seemed to turn against the industry. But he never challenges the economic claims, never estimates job impacts, and never questions U.S. Sugar’s sincerity about jobs in light of the company’s 2008 plan to shutter its entire operation and leave town. Could DeFede have demanded the straight-up truth? Refused to entertain the evasion and lies and pressed for answers on why the sugar industry won’t help cut toxic discharges or restore freshwater to the Everglades? No. Not without challenging the foundational lie that sugar’s working as hard as the rest of us to solve these problems. Of course TC Palm’s reporting shows what most of us already knew: The industry has never worked in good faith to fix Florida’s plumbing. And they won’t. As Grunwald told DeFede, “So much of the system is managed for their benefit.” Sugar doesn’t want to fix it--for them, it’s all working just fine. That can change. This year Joe Negron and the Florida legislature delivered a chance--a slim chance--to defy the sugar industry and restore the Everglades and our waterways. It can work. But only if we confront the truth about sugar’s opposition to the solution. P.S. Bullsugar.org supporters are making a difference and winning over lawmakers to reform Florida's water management policies. If you can, please join them and click here to make a donation for a clean water future.